To support students on campus with no meal plan, the Cowell Coffee Shop became a free cafe. Staff only asks that you fill out a survey anonymously to support its purpose in providing a safe environment. Photo by Tiffany Lee. About 48 percent of UC undergraduates experience food insecurity, according to a 2016 UC-wide study. 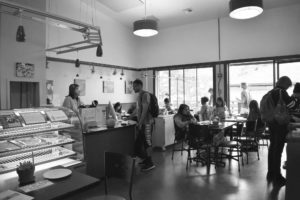 In an effort to combat food insecurity at UC Santa Cruz, food systems and dining leaders announced in May that the long-standing Cowell Coffee Shop would be transformed into Cowell Coffee Shop: For the Peoples. It celebrated its grand opening on Nov. 7. Students no longer have to purchase items in the cafe. Instead, the space offers a food pantry as well as free basic needs resources such as tea, coffee and pastries to UCSC students. The cafe will also serve as a functional study space. Since the beginning of fall quarter, the remodeled Cowell Coffee Shop: For the Peoples limited operation leading up to the grand opening. Now, in addition to full operations, the space offers quarterly “Slugs in the Kitchen” cooking classes, CalFresh advising and Basic Needs workshops. The coffee shop is funded by grants from UC Office of the President. This Basic Needs program is part of a large movement across the entire UC system in efforts to combat food insecurity. The cafe is only one component of everything UCSC groups and students are doing as part of this effort, said Tim Galarneau, UCSC food systems education and program research specialist. Galarneau and others encourage students to use CalFresh, another program that tackles food insecurity. The federally mandated and state-supervised food stamp program allows students to receive up to $192 monthly for groceries without impacting their financial aid. Not wanting to accept the “food stamp” label, students often shy away from CalFresh because of perpetuated stigma. “At the moment, we are working to change the way our campus talks about CalFresh, in addition to working with the greater Santa Cruz County to provide CalFresh access to both our undergraduate and graduate student body,” said Dean of Students coordinator Rosalinda Gallegos. When it was proposed in February of this year, some alumni and students felt the coffee shop was too historic to transform. Yet, executive director of Dining William Prime said its transformation fared well for the campus overall. Over 3,000 students took advantage of the food pantry, food preparation workshops and the food and beverages provided in the coffee shop since Oct. 8, said Tim Galarneau. Since the SUA pantry only has a year-long contract, the Basic Needs cafe will supplement the SUA pantry and provide a longer-term solution if it closes. The Basic Needs program provides campus-grown vegetables and fruits, as well as ready-made meals and other grocery staples.